The Empire's main peacekeeping facility, the Death Star, remains on high alert. A GALAXY FAR, FAR AWAY -- The Galactic Empire today has raised their terror alert level from yellow (elevated) to orange (high). The move comes in response to an increase in the perceived threat from the terrorist group known as the "Rebel Alliance" due to their recent activities. 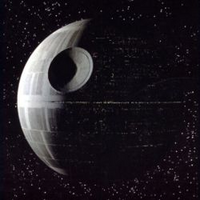 Most notably, a breakout was staged at the Empire's chief peacekeeping facility, the Death Star, resulting in the escape of known terror suspect Leia Organa. Exploiting the convenience of its central waste management system, two men described as "scruffy" and "nerf-herder" managed to smuggle Princess Leia from her holding cell. In concurrence with the Empire's no-tolerance policy, Organa's home planet was summarily destroyed. All three suspects (as well as their giant dog) are considered to be traitors to the Empire and are to be blasted on sight. While Empire officials insist the decision to elevate the alert level is merely a precaution, galactic political analysts are not so sure. Many have pointed out that the significance of the death of known Rebel associate Obi-Wan Kenobi has been severely overplayed by the Empire's press liaisons. "Kenobi was nothing but an old man with a light-up sword and detailed knowledge of the inner engineering schematics and tractor beam mechanics of the Empire's headquarters," said one such analyst. "The fact the the Empire is drawing so much attention to this minor player's demise is alarming, and may suggest that the Empire is scrambling to keep terrorist activity quelled." Such obvious treason by critics of the Empire has been dealt with swiftly, and any detractors of the invincible Galactic political machine have been detained indefinitely. Grand Moff Tarkin, seen here with the Junior Assistant to the Grand Moff, Darth Vader, has assured an end to the terrorist group known as the Rebel Alliance. In an official statement, Grand Moff Tarkin, who was recently promoted from Minor Moff, expressed confidence in the Empire's ability to deal with the "rebel scum." He seemed confident and powerful until a reporter asked him to comment on rumors circulating that detailed blueprints of the Death Star may have been obtained by the Rebel forces and stored on a droid resembling a garbage can. At this point he became agitated, insisting that the Rebel Alliance was not a threat to the Empire, and that "those guys look like dorks." 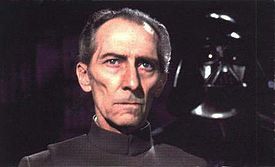 Tarkin finally vowed immediate victory against the Rebels, promising to crush them with one swift stroke. "The rebels are not a major concern of our Homespace Security Department. We have several leads on their location, and are engaged in aggressive measures, rather than preventative ones. " At press time, the Empire's fleet was embarking to the suspected Rebel Headquarters on Yavin, and rent on high-end condos in the Death Star has dropped to an all-time low. This page was last edited on 4 June 2012, at 09:34.